New sightings, sounds, smells, tastes, and touch are waiting for you to experience. 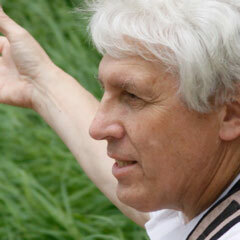 Do not miss the opportunity to explore nature niches everyday. Spend a few minutes outside reaping at least one newness each day. Do not make a resolution that you will not keep. Instead, find something new for this year and savor it as the special. 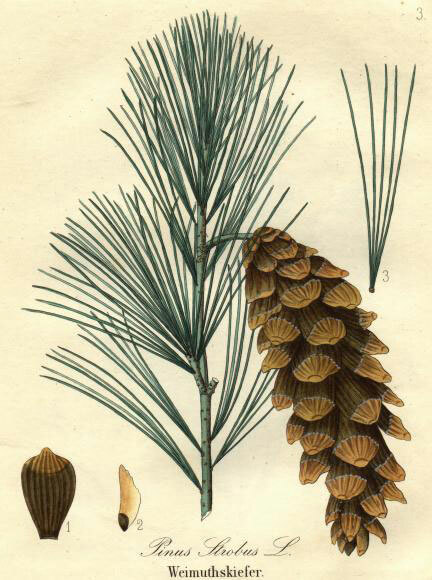 The White Pine tree is the only pine with five needles held together by a tan follicle at the base. Photo from www.bates.edu. It might be most rewarding to discover something you have not noticed previously but relish things you have known and find new joy in experiencing them this year. You might know Black-capped Chickadees but enjoy them anew this year. Look closely at a tree branch in your yard to notice buds. Can you count the small bud scales that cover the bud during these cold winter months? Some trees like the Bitternut Hickory do not have protective scales over the embryonic leaf and stem tissues. Two small leaves tightly crumple as protective covers over the inner tissues. Willows have a single scale over next spring’s new growth. Oaks have several sturdy scales covering the nearly microscopic leaves and stems within. Make it simple and enjoy things you want to explore. Continue to make new discoveries for 365 days. The year has already progressed a few days. There will be days without observations so catch up by making more discoveries on other days. Keep a list of new experiences daily. You can keep track what you have seen, heard, smelled, tasted, or felt. It is good to list date, location, time, and observation. Look over your list once in a while to refresh your memory and relive the experience. This can be the beginning of nature journaling. Walk with a friend on the White Pine trail. Avoid being so engrossed in conversation that you miss the natural world. Stop along the trail and use your senses. Share a discovery with your friend. It might be as simple as pointing out the sound of an American Crow. You might take notice of how many pine needles are held together in a cluster. White Pines have 5 needles held together by a tan follicle at the base. Each needle is shaped like a cut piece of pie. Two sides are straight and meet at the inner point. The outer edge is curved like that of a pie. Run your fingers from the base to tip and notice they all fit together like a freshly cut pie. I contend this is a pine tree’s version of the compound leaf. I have never heard of needle clusters being referred to as compound leaves but each cluster is one needle-like leaf divided into five parts. When spread apart they make it possible to capture more sunlight for photosynthesis. Red Pines, Jack Pines, and Scotch Pines have two needles in a cluster that fit together like two half moons. Spruce and firs have one needle attached directly to the branch. Feel tree trunks to notice different bark textures. Do some feel smooth or rough, furrowed up and down or crosswise? Do trees have different bark colors? When looking at birds in flight, are wings long and narrow, short and wide, light or dark? Are tails longer or shorter than wings? Be cautious with tasting but bite into a cherry twig and describe the taste. Try tasting a Sassafras twig. Find a White Oak acorn and taste it. Do the same with a Red Oak acorn. It is good to have a bottle of water with you just in case you do not like a taste and want to rinse your mouth. You might discover why deer have preferences for what they eat. Smell each item to discover new pleasant or unpleasant smells. Rather than isolate yourself from nature when outside with music coming through ear plugs or by being totally engrossed in conservation, put the ear plugs away for a few minutes or cease talking for a few hundred feet. Stop at a random location for a short time to experience the surroundings. Introduce a friend to a nature’s wonderful world. Turn New Year outdoor experiences into meaningful conversations full of newness.